Our guest post from the High Pay Centre summarises their full report "Football Mad: are we paying more for less? ", which is well worth a read too. You can see data that shows how money is being sucked away from grassroots football and into the pockets of players in the top clubs. No wonder our national team hardly ever gets beyond a quarter final, if that! It's also an example of how one business sector can end up dominated by a small handful (think Man U, Man C, Arsenal, Chelsea) so powerful that all the others are crowded out. Other clubs can only hope to rise above them by paying their players massive amounts of money. Much of that money is borrowed. In UEFA’s 2010 benchmarking report, the UK Premier League’s cumulative debt was £3.5bn, 56% of the combined debt owed by the 732 top flight clubs across Europe. Manchester City (a club that currently spends more on players than it earns) won the league on the last game of the season with two goals scored during injury time, scored by players with a combined purchase price greater than the entire turnover for half of the teams they were playing against in the league. In the last 20 years of English football over half of its professional clubs have been insolvent. When clubs do go into insolvency the rules are that the players’ salaries must be honoured first, after which everyone else gets paid what's left over. So, for example, when Portsmouth entered its first administration in 2010, local business lost £400,000 in unpaid debts. At Darlington in 2009, unsecured creditors like local businesses received 0.0009% of what they were owed, and HMRC (that's you and me!) were owed £404,376 but got just £3.64– not even enough to buy a couple of pints to celebrate. In its 2012 windup CVA, Portsmouth's unsecured creditors were offered 2p in the pound. There are other sectors that are totally dominated by a small handful of companies. Think banks, energy, telecoms, and rail. As the full report says, when it comes to football the game is really over before its even begun, and regardless of the outcome, we already know who the real winners will be. Football Mad: are we paying more for less? Research from the High Pay Centre shows how dramatic wage escalation in football has made the game less competitive and more expensive to watch, while also channelling the vast sums of money coming into the game from TV money to casinos and Mercedes dealerships, rather than grassroots coaching. Clubs competing in the Champions League receive in excess of £200 million in revenue, more than double the amount earned by smaller Premier League clubs. Most of this money goes straight into the pocket of expensive new signings, with Manchester City, for example, spending 114% of turnover on players' wages. The net result is that the supposedly exciting and unpredictable Premier League has become depressingly uncompetitive. In the past three seasons, a club finishing in the bottom three has beaten a side finishing in the top three on just four occasions out of 54. Statistically, last season’s Bolton Wanderers team could have played their Manchester United counterparts 10 times and would not expect to beat them once. It’s a similar story between the divisions. 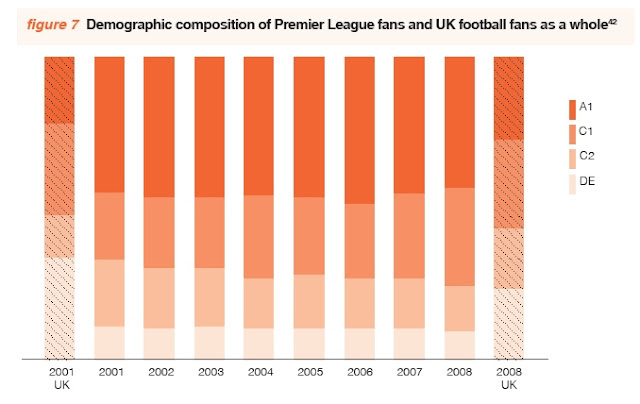 Prior to the establishment of the Premier League, 50% of TV revenues were distributed across all 92 football league clubs. Today far smaller payments are made at the discretion of the Premier League, with the money again being spent on players' wages instead. 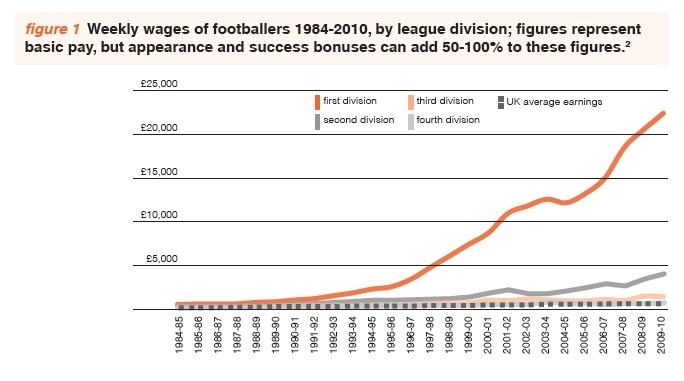 Premier League players earnings have risen by 1508% since 1992, compared with 518% in the second tier, 306% in the third and 233% in the fourth (not to mention 186% across the population as a whole). As a result, only one team, Norwich City, achieved promotion to the top flight in the last five years without either receiving the ‘parachute payments’ available to ex-Premier League clubs or running at a desperately unsustainable wages to turnover ratio of over 100%. Half the professional clubs in England have been insolvent at some point in the last 20 years. The most depressing thing about all this is that the negative effect of pay escalation on the England football team is not insignificant. The bi-annual navel-gazing over the poor technique of English footballers that greets our early exit from every major tournament can be traced back to our lack of investment in coaching. In England there are 812 registered players to every qualified coach. In Germany, it’s 150, despite the fact that German league rules dictate that clubs must run on a breakeven basis, and their ticket prices are lower, meaning there is less revenue to invest in coaching. It hardly needs saying, that Germany – and Spain, Italy and France, where the number of qualified coaches is also much higher – have consistently outperformed England at World Cups and European Championships. In English football, as in many other industries, excessive wages are draining resources that could be used for genuine investment. The High Pay Centre is an independent non-party think tank established to monitor pay at the top of the income distribution and set out a road map towards better business and economic success. Hardly news is it? Try telling the 'Secret Footballer' and he'll have you believe a Premiership player's life is tough and having more money than a normal person could ever spend, is little recompense for the empty, hollow, lives they lead. No one is making you play football, you can always do something else. Premiership football is an obscene, bloated caricature of the 'beautiful game', predominantly populated by halfwits and paid for by the gullible. If we all stopped watching Sky, paying over inflated ticket prices etc, these bankrupt businesses would soon disappear up their own (collective) fundament!